I had promised some pictures and video. 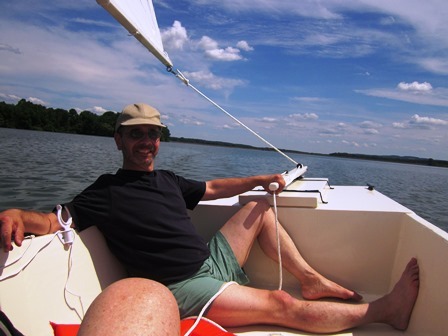 Here are some examples from a short sail on Spruce Run Reservoir in NJ on July 19, 2014. A short bit of rowing proved that the boat rows reasonably as a single, but the forward station is too crowded. The fore oarlocks were placed 27 inches behind the forward bulkhead, as designed. 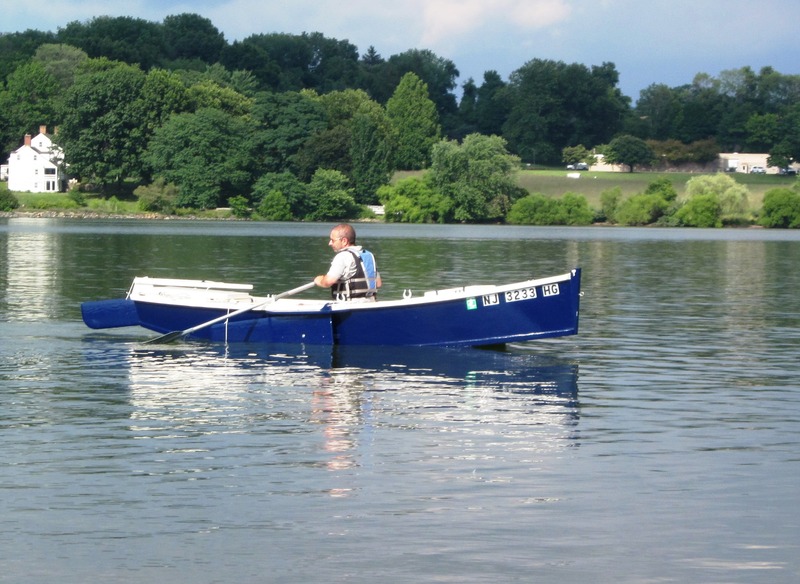 Rowing with 6.5 ft. adjustable aluminum oars – dropping the leeboard later provided directional stability. Otherwise, the boat crab-walked in the light breeze. Here is the boat rigged. The poly sail made from Dave Gray’s kit (http://www.polysail.com/index.htm) has met or exceeded expectations. Exploring a gravel point on a small island. A short video of a relaxing broad reach. I can report a successful launch today. The boat performed very well. My friend Marty, a neighbor who has owned and sailed a number of boats, had monitored the build and encouraged me throughout the process. We launched at Spruce Run Reservoir in our home state of New Jersey. At the ramp, I was relieved to see that the water stayed on the outside of the boat. Casting off, Marty initially took the helm. Very light Force 1-2 winds had us going slow most of the time, barely maintaining steerage, sometimes not. Unfortunately, we had no photographer, and were so preoccupied with rigging and sailing that we took few photos and no video. I’ll rectify that on the next excursion. The few breezes we had provided delightful performance. The boat seemed to point well to windward, side-slipped very little on a reach, heeled only a bit before stiffening up and moved well in the light breezes that occasionally popped up. In short, it did everything it was supposed to do, and did it well. 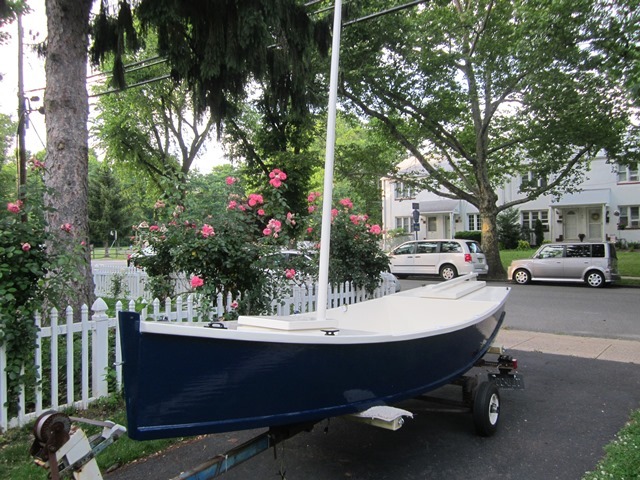 I can’t wait to try it out in a more substantial breeze. As for the boat’s personality, it’s not tippy or frenetic. It’s a bit noisier than I expected – bow slapping wavelets to windward – leeboard gurgling like a quiet brook – but the noises are soothing and you can hear exactly what the boat is doing. It’s a peaceful boat to be in . . . and that’s the point. I am really looking forward to more varied excursions. 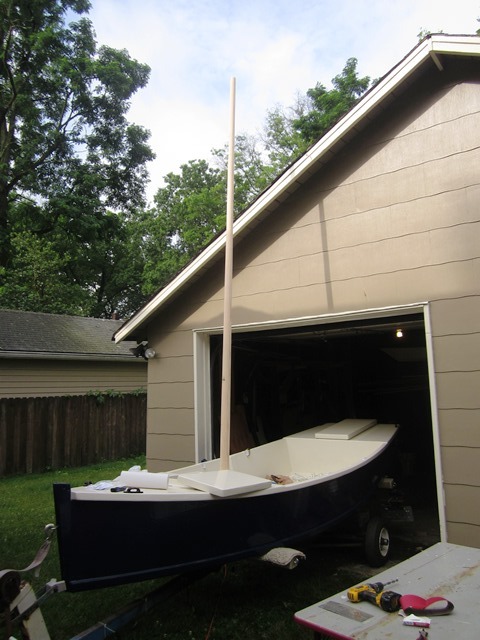 The mast has been re-glued, fitted to the boat and seems solid. The sail has been fitted and all the rigging hardware has been installed. The sail sets up nicely – I wish I had grabbed a picture. On Monday, I brought both a notarized letter describing the boat’s construction and a pile of receipts to the New Jersey Motor Vehicle Commission, which directed me to the New Jersey State Police. 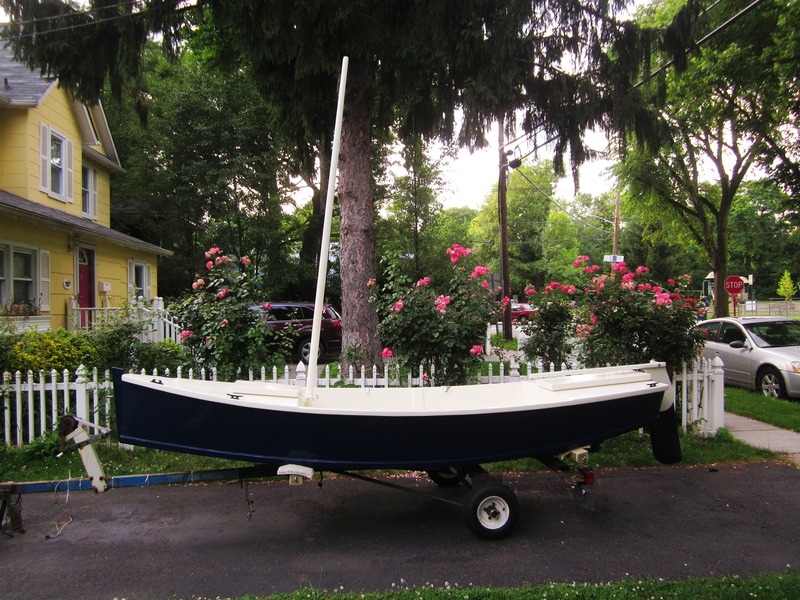 Apparently, the NJMVC would not issue a hull number until the NJ State Police inspected the vessel and agreed that it was indeed a home-built boat. 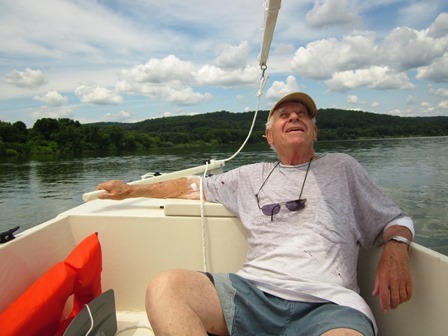 Yesterday, I towed the boat to the State Police Marine Station on Lake Hopatcong. The aged trailer actually worked pretty well. Once there, the officers agreed that it is in fact a boat suited for New Jersey waters and issued the necessary papers. An hour and $72 later, the MVC issued a hull number, title and registration. We’re ready to launch as soon as I paint the registration numbers on the boat. The day following my prior post, I hoisted the sail for the first time, to horror. The boom (the stick at the bottom of the sail) wouldn’t clear the deck. I couldn’t believe it. (I still can’t believe it.) The mast was too short. A quick check of the drawings showed the obvious dimension I had missed. In between the next 24-hours of rants to self (“Unbelievable”, “Just read the plans for once.”), I imagined a life of boat builder shame (Wife leaves in disgust, kids disavow eccentric father, the soft whispers of friends just beyond ear-shot). 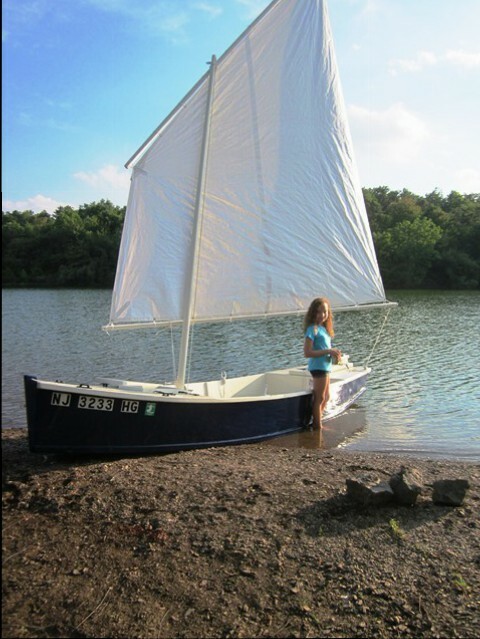 I also realized the only path that even closely resembled redemption was to build another, better mast ASAP and just get the darn boat in the water. On the bright side, the lessons learned on the first mast would make this a faster build. And the second build would allow me to photo-document the process, which I had previously neglected to do. There are a number of ways to build a mast. I did not find JM’s book particularly descriptive. 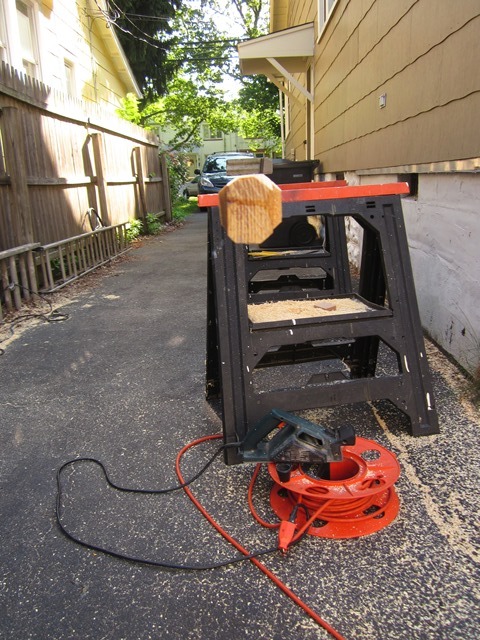 While there are varied methods described by other builders, I used a method loosely based on a Wikihow instruction, albeit with far fewer than 37 steps. Here’s how. 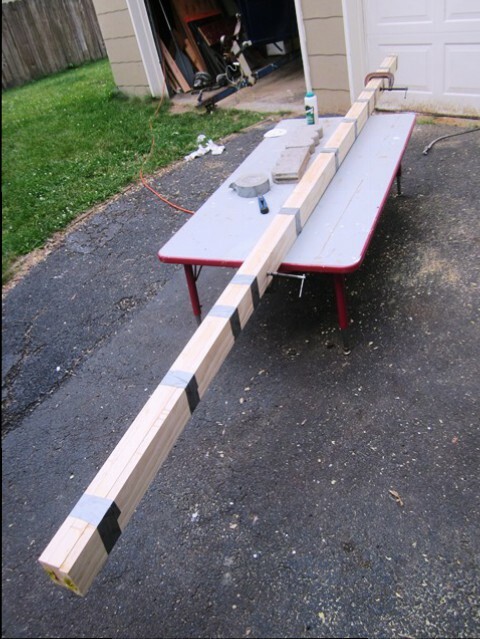 The mast is 2.5 inches wide at its base, so a 5/4 x 4 and two 1 x 4’s were needed. I got lucky and found good-looking 12-foot boards at a big box store. I went home and laminated them directly using Titebond III wood glue. With only 3 suitable clamps, I wrapped the boards with duct tape at 1-foot intervals. Mast blank glue-up the following morning. 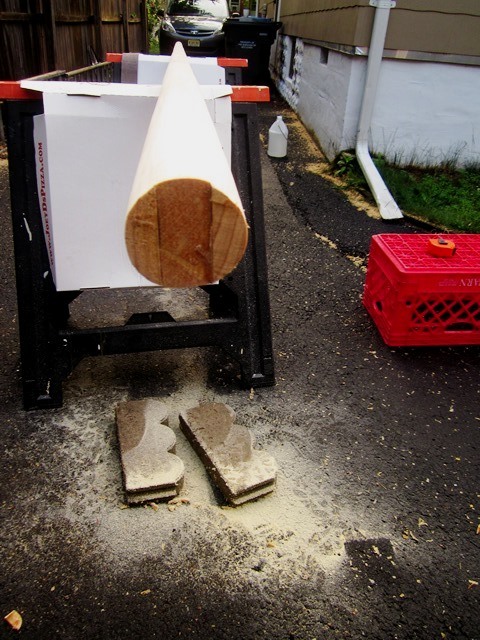 UPDATE 7/10/14 – This mast developed separations between the laminations because of glue starvation. Be sure to clamp the boards more aggressively than I did. This mast was repaired by flooding the open seams with glue, then reclamping. We’ll see how it holds up after launch. UPDATE 9/2015 – The boat has been out in variety of conditions and the mast has performed well. The specification for the lowest 2-feet is a 2.5-inch diameter. The mast tapers to 1.5-inches at the top. 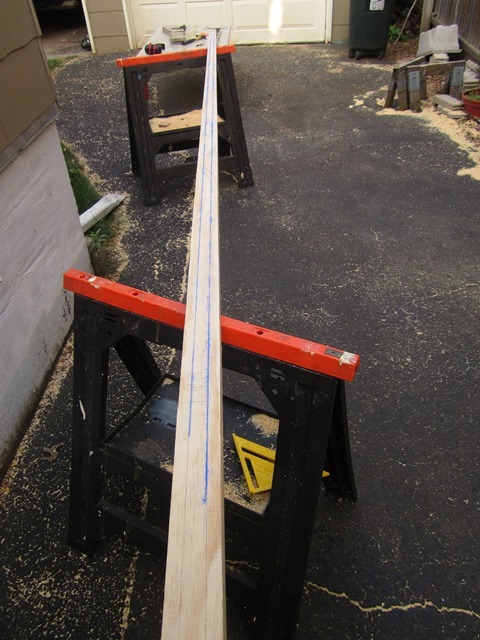 To dimension the mast blank, mark the center on each end of a mast face, and at the location where the taper begins. 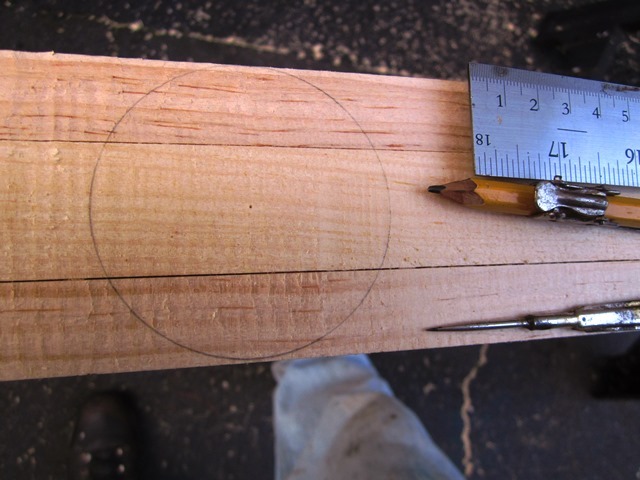 At each of these points, measure from the center line outward 1/2 of the planned diameter and mark. Connect the marks with lines as shown below. I snapped chalk lines for tapers on the two edges, which turned out to be faster and more accurate than drawing a pencil line using a straight-edge. The chalk lines connect the marks and define the taper of the mast. 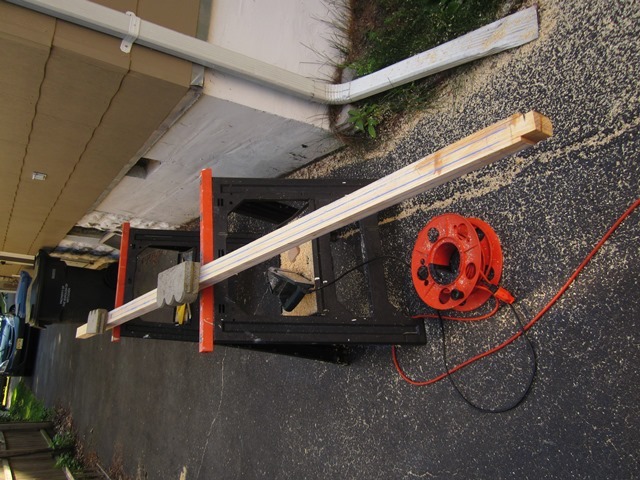 On the prior mast, I used a circular saw to cut the excess material, forming a tapered square mast. 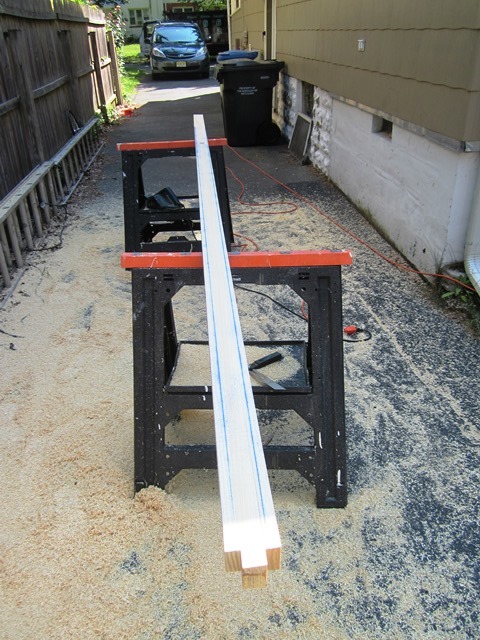 But I did not like running a circular saw along narrow boards, and this time used a power planer. This required additional time, but was much more controllable. After trimming two sides, roll the mast 90 degrees and repeat. 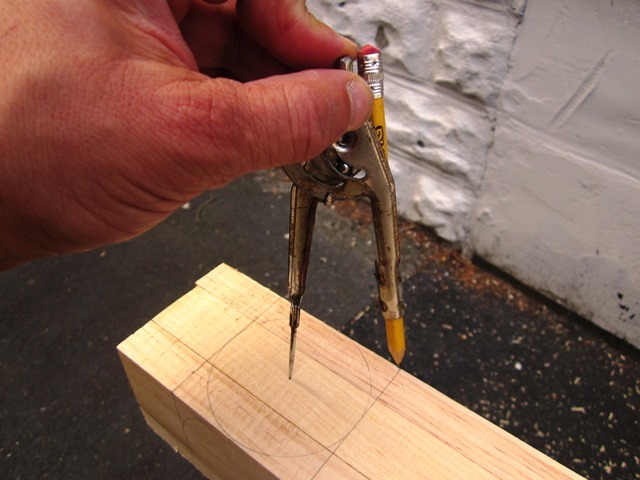 At the ends of the mast and the beginning of the taper, use a compass to draw a circle that spans the entire face. Draw tangent lines to form a box. Using a compass, measure the distance from the center of the circle to the corner of the box. Put the point of the compass on the each of the 4 line ends and mark the line at the measured distance. 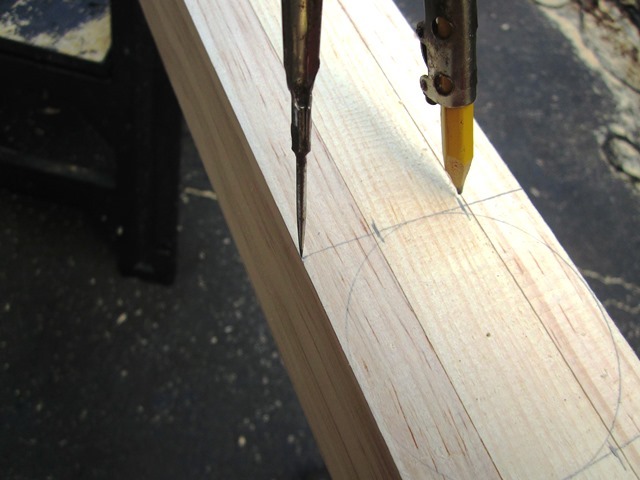 Draw or snap lines to mark the boundaries for planing off corners. The bricks were enough to hold the mast in place, at lease when using a power planer. 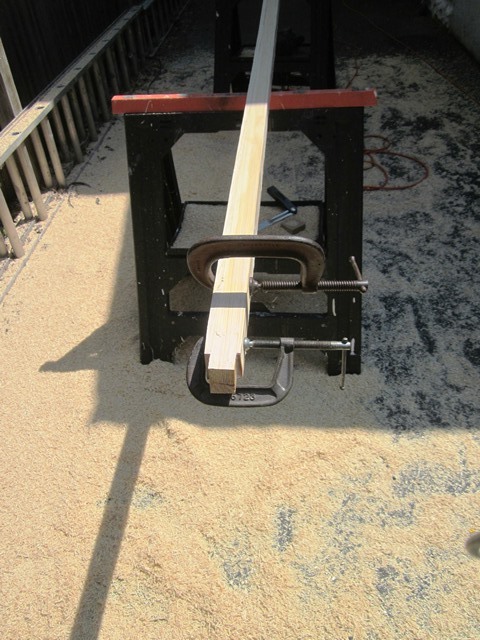 Some manual block planing later required weights on the saw horses. At this point, I used a low-angle block plane and a random orbital sander with 60-grit paper to knock down the eight edges. This left a symmetrical tapered mast with eight rounded corners. 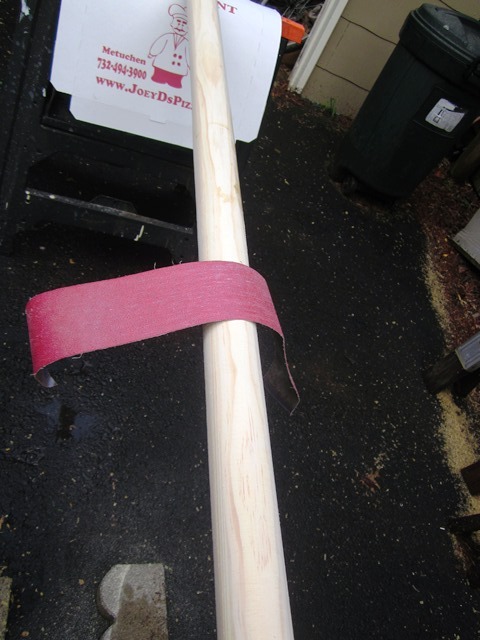 To round it all out, I cut open a 3″ x 21″ 40-grit sanding belt and sanded across the grain by hand. Leather gloves were needed as 40-grit rips open skin. Sanding went on for an hour, and required that I straddle the mast in lieu of a bona fide mast holder. 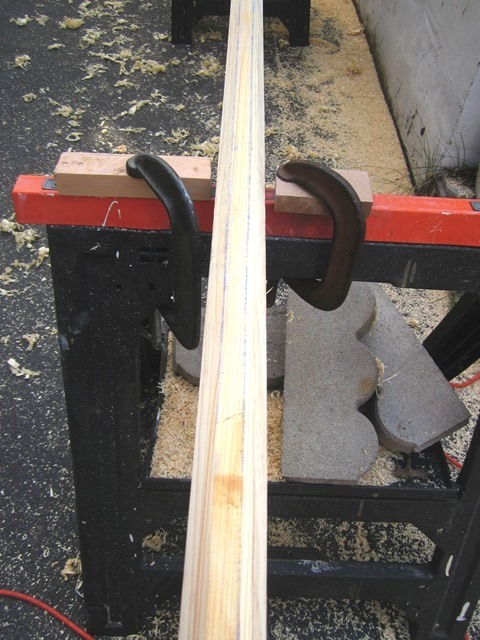 A sanding belt rounded off the corners. More sanding with the random orbital and 60-grit removed the sanding marks left by the 40-grit paper. After more planing and sanding, the mast came out round after all. This boat already had a mast partner and a mast step. More planing and sanding was needed to fit the base of the mast to those parts, but now the mast bolts up rock-solid, even stronger than before. 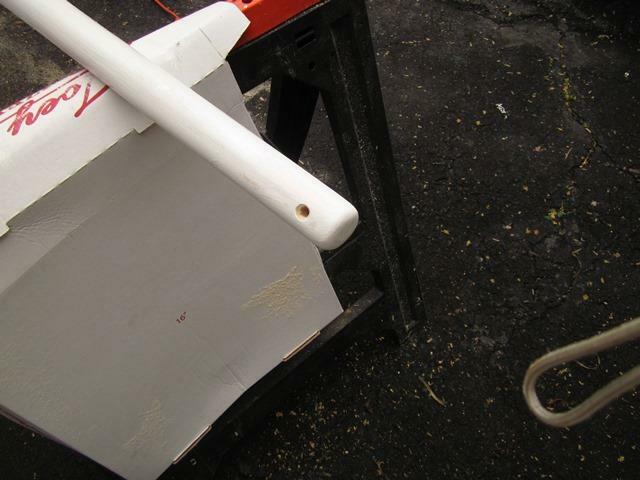 A 3/8-inch hole was drilled for passing the 1/4-inch halyard used to raise the sail. I used a round sanding stone on a drill bit to bevel the edges. I’m sure that if I ask six boat builders how to build a mast, I’d get twelve-and-a-half answers. This method worked for me, and including primer application, took 10 hours over three days. I’m pleased with the result, which seems stronger than the first mast. And getting the build back on track has enabled me to look at myself in the mirror again … if only with one eye. Maybe this thing will actually see water next week. Pulled the boat out of the garage today. It rests on custom bunks. Many small details to resolve, but the boat could see water in a week or so.